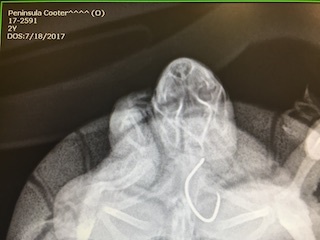 A female peninsula cooter, which is a freshwater turtle, was admitted from Cape Coral after it swallowed a fishing hook on the end of the line of a fisherman. The fisherman immediately brought the turtle to CROW so that the hook could be removed safely. Radiographs showed the hook inside the turtle's body and the veterinarians acted quickly to remove it. The hook was successfully removed thanks to the quick action by the veterinarians. First, the veterinarians attempted to remove the hook using a rigid endoscope through the turtle's mouth. When this proved unsuccessful, a small incision was made in the turtle's neck in which the barbed end of the hook was pulled out and snipped off with wire cutters. The remaining piece of the hook was then gently pulled out through the mouth using the fishing line still attached to it. 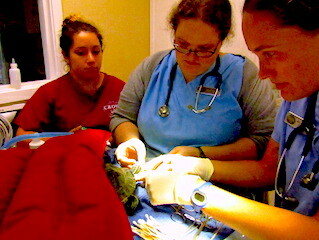 The turtle will undergo wound management and once the incision heals it can be released. After a few days of monitoring there was no blood noted in the mouth and the suture site was clean. The peninsula cooter was released back to the canal in Cape Coral on July 20.